Money can be defined as anything that people use to buy goods and services. Money is what many people recieve for selling their own things or services. There are many kinds of money in the world. 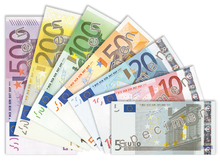 Most countries have their own kind of money, such as the United States dollar or the British pound. Money is also called many other names, like currency or cash and (in India) 'rupee'. The idea of bartering things is very old. A long time ago, people did not buy or sell with money. Instead, they traded one thing for another to get what they wanted or needed. One person who owned many cows could trade with another person who had a lot of wheat. Each would trade a little of what he had with the other. This would support the people on his farm. Other things that were easier to carry around than cows also came to be held as valuable. This gave rise to trade items such as jewelry and spices. When people changed from trading in things like, for example, cows and wheat to using money instead, they needed things that would last a long time. They must still have a known value, and could be carried around. The first country in the world to make metal coins was called Lydia. These first appeared during the 7th century BC, in the western part of what is now Turkey. The Lydian coins were made of a weighed amount of precious metal and were stamped with a picture of a lion. This idea soon spread to Greece, the rest of the Mediterranean, and the rest of the world. Coins were all made to the same size and shape. In some parts of the world, different things have been used as money, like clam shells or blocks of salt. ↑ 1.0 1.1 NOVA (26 October 1996). "The History of Money". NOVA. WGBH Educational Foundation. Retrieved 23 April 2015. ↑ 2.0 2.1 "The origins of coinage". Trustees of the British Museum. Retrieved 23 April 2015. ↑ "A Short History of Money". Chinese Archaic-Jade Shop. Retrieved 23 April 2015. ↑ "The cradle of the European banknote stood in … Sweden". Museum of the National Bank of Belgium. Retrieved 23 April 2015. ↑ Rebecca Greenfield (3 February 2011). "The First Paper Money in America Was Issued on This Day in 1690". The Atlantic. The Atlantic Monthly Group. Retrieved 23 April 2015.